I have come to the realization that TIME moves far faster than I can. I can't believe that we are almost half way done with August already. I had to take a little break after the Big A$$ Indie Art and Craft Show. It was great and a whole lot of fun! The next shows coming up are the "St. Charles Mosaics Festival of the Arts", St. Louis Hills"Art in the Park", Green Craft Art Fair, and The Lady Bug Beads "Bead art Fair". The planning for these shows are intense but rewarding! I thought I would start off slow and I created this little piece of fun. 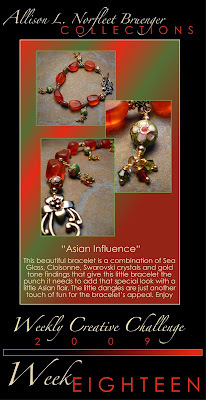 I love jewelry with an Asian feel and this one gave me a chance to wire wrap and string all in one piece. This piece throws me back into the FUN and I look forward to next week's design. I will be heading to Detroit so I might post my blog on Saturday. Well Enjoy and Keep Creating. Your pieces do have a very nice Asian flair (some anyway.) You create such lovely jewelry! !